I opened an RESP the month after my son was born, and I have been diligently contributing such that my contributions will nearly reach the maximum amount that the government will match by 20%, and the extra room has been filled with money my son has received as birthday/Christmas gifts (he’s almost 5 now). I haven’t kept careful tabs on the actual amounts contributed, so I recently went into the bank to get a statement printed about contribution information. I discovered that I have “over contributed” in the sense that I have contributed money that the government has not matched because annual totals exceeded $2500. The over contribution has added up to ~$300 over the years. I have read that amounts that the subscriber contributes can be withdrawn at any time with no tax penalty, I was wondering if I could withdraw that $300, then re-contribute it (in the next calendar year that is, on target to max again this year) to get a 20% match of that amount? Are there any penalties or gotchas I need to be worried about? To summarize – Bryan made some extra contributions to his son’s RESP that didn’t get any grant because the maximum grant was already paid that year. He wants to know if he can withdraw the contribution amount that didn’t get any grant without any penalty and then re-contribute it to the RESP. Unfortunately, this plan won’t work. Bryan should just leave the “over-contribution” in the account and keep closer track of his contributions in the future. Assisted contribution: A contribution to an RESP account that receives a grant. Unassisted contribution: A contribution to an RESP that doesn’t get any grant. Bryan suggested that RESP contributions can be withdrawn at any time without any kind of penalties. In fact, this is only true if the child is attending post-secondary education and is eligible for RESP payments. 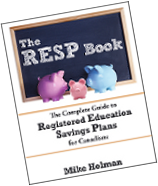 If the child is not eligible for RESP payments (ie not going to school), withdrawing RESP contributions will likely result in losing some of the RESP grant money that is in the account. Now you might be thinking that you should be allowed to withdraw unassisted contributions without penalty, but that’s not how the withdrawal rules work. When a financial institution completes a contribution withdrawal request, they are required by the government to withdraw from the assisted contribution bucket before withdrawing from the unassisted contribution bucket. The result is that if Bryan tries to withdraw the $300 of unassisted contribution money, he will end up withdrawing from the assisted contribution bucket and the government will claw back the amount of grant attributed to the original $300 contribution which will be $60 worth of grants. There are rules which allow over-contribution withdrawals without clawbacks. These only apply to contributions over the lifetime contribution limit of $50,000. So for example if you end up contributing $51,000 to an RESP beneficiary ($1,000 more than the lifetime limit), you can withdraw the extra $1,000 and no grant clawback will occur. In Bryan’s case however, there was no over-contribution, so those rules don’t apply to his situation. Contributing money to an RESP that doesn’t get a grant is not an over-contribution. You have to keep track of contributions yourself. The only limit on RESP contributions is the $50,000 lifetime limit. Other than that – you are allowed to contribute whatever you want, whenever you want and nobody will ever tell you that some or all of your contribution is not eligible for a grant. If you aren’t sure where you are in terms of contributions, call your financial advisor or financial institution and ask. You can also call the HRSDC at 1 888 276 3624. They can provide the amount of contributions and grants made for your child. Also make sure you understand the rules about how much you can contribute to an RESP in any given year, how the retroactive contributions work and also the RESP contribution rules for 15, 16 and 17 year olds. With just 13 more years to contribute before withdrawals start, that would be 13 x 2500 well below the $50k limit. Is it not better to accumulate inside the RESP even if not matched? Keith – That’s a good question. Given that all the money in an RESP can grow tax free and any growth is taxed in the hands of the student (ie low tax), I think a good argument can be made that if you are going to be saving more than $36,000 (for the max grant), doing so in an RESP makes sense. There are issues however if the child doesn’t go to school and there will be penalties on the growth in that case. My suggestion is for someone who has reached the maximum RESP grant amount is to then max out all other accounts (ie TFSA, RRSP (if appropriate) and pay off all mortgage + consumer debts before making RESP contributions that don’t receive a grant. I agree and especially before making investments in limited partnerships and other dodgey tax dodges. The ones that receive a grant are as good as RRSPs and better than TFSAs assuming that they are used as planned. In my case, with 5 grandkids ranging in age from 2 months to nearly 16, it is a major form of investment in the future. I am not sure of the fallback plans if the kids don’t go on. But here is hoping it won’t be a problem. Plus we are talking about the difference between $36k and $50k per child. I hope to have that luxury with 5 of them! If I’m reading this correctly, Bryan has only contributed $7800 (5*2500+300), right? So next year, if Bryan leaves that $300 of overcontribution in and contributes nothing else, the federal government would provide 20% ($60) assistance then, wouldn’t it? So all he’s really lost is the one year’s use of $300. My understanding was that you could put $36,000 into the account on day 1 and then would receive $2500 each year in grant. @Tim – No, that’s not the way it works. If you contribute money that doesn’t receive a grant – that contribution never gets a grant. Not next year – not any year. Well, I have made a terrible mistake. I must have misunderstood what the HRSDC person told me. We had a windfall, and I put $31,000 in my 7 year old’s RESP, thinking that this would qualify me for the $500 grant every year. We had received about 6 years of grants previously. My other option is to leave the money there and pass up any further grants (since we’re over the $50000 lifetime limit), a lost opportunity of (12x$500) $6000. Tim, don’t jump off the bridge yet. I’ll send you an email this weekend. Ha, thanks, Mike. I’m not in despair, just disappointed that a move I thought was prudent and efficient turned out to be a costly bungle. I’ll watch for your note. I have made a terrible mistake for last 2 years. I must have misunderstood what the HSBC person told me. I put $44,000 in family plan RESP for 3 sons, and also $50000 last month, now I have to withdraw those as over contribution as soon as possible this month. Because they already reach their life time limit $50000 excluding these extra contributions. They are in stocks, should I transfer in-kind back to my non-register investment account? Which stock, a capital loss stocks or the capital gain stocks? Now, I know I need to file a tax return on those over contribution to CRA at the year end. I need your comment before I make withdraw or should I sell the stocks inside the RESP account then withdraw in cash? Again, which one to sell in the RESP account? Thanks. Hi Mike, I have a RESP account with HSBX invest direct, I made a mistake to over contribution excess my life time limit $50000 by $20000, so the total is $70000. so I have to withdraw the $20000. Do you have any support document or link from official CRA department to state that. Because after I withdraw the $20000 the HSBX also arrange to repay all my grant. From your note that I read, the $20000 is unassisted contribution, how the HSBX has to ask my to withdraw $20000 assisted contribution first. Do they have the right to do that. Now I need to find out those guideline to flight with them.